is a Central American Country, just slightly smaller than Maryland. It lies between the Caribbean Sea and North Atlantic Ocean and is home to over 9 million souls. The people of Haiti depend largely on agriculture for income and stable goods. Unfortunately, although 28% of the land is arable, only 11% of this small country is planted with permanent crops. The country suffers from extensive deforestation, soil erosion and even more critically, a lack of potable water. Malaria, typhoid fever, waterborne bacteria and AIDS are among the diseases that take the live of the young and old. Maternal death rates are high and that coupled with disease and poverty has created a huge population of orphans relative to the size of this country and far beyond its ability to care for them. 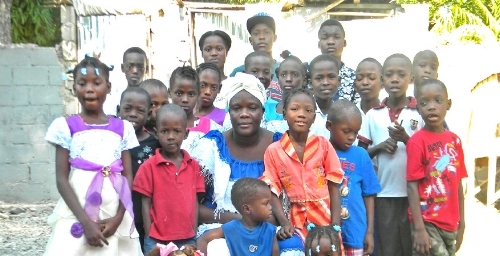 15% of all children in Haiti are orphaned or abandoned (social orphans), with 200,000 living in orphanages of some kind and the balance on the streets or living with relatives who far too often are too poor to care for their own 3.8(average) children. 80% of the population of Haiti are below the poverty line with 54% living in abject poverty. Nearly 2//3 of the workforce in Haiti are unemployed and just over half of the citizens over age of 15 can read and write.